Glymm had also posted the above message on its Facebook page so I shared it immediately but it appears that Glymm has since taken down its website, Facebook page, and Twitter account. I'm glad Glymm has finally issued this communication as it should be sufficient documentation to dispute the charges with our credit card companies for any and all products not received, regardless of whether we had a monthly subscription or paid in advance for a series of months. As I mentioned in a previous post, I have 7 months remaining in my 12 month subscription. I have now disputed the charge for all 7 outstanding months and expect to receive a refund in the next 100 days or so. The customer service representative I spoke with at my credit card company was extremely helpful. I sent him my original e-mail invoice showing the yearly subscription and Glymm's e-mail about closing the company and he confirmed that the dispute is in progress. Note that credit card companies can have different policies so be sure to call your credit card company if you are in a similar situation. Finally! I unsubscribed over a year ago, but I'm just glad things have finally been settled. Sad to see Glymm go, but they handled the whole situation awfully. i totally agree. the way things were handled in the last couple of months was atrocious. glad it's finally done! Gosh I KNEW this was going to happen! I even emailed them once last year asking what would happen to yearly subscribers if Glymm were to go out of business and they said it would not happen any time soon! All the negative comments on social media prior to this whole fiasco must have made an impact with their suppliers/brands. Not that I'm blaming everyone on facebook, I am guilty of one or two upset comments. I honestly think the quality of their boxes went down hill not long after I started (Feb 2012) and they didn't compare to what I saw people receive in 2011! I genuinely feel sorry for Glymm. I do not doubt that their intentions each month were good, they just weren't what the people wanted I guess! I think in 2011 they had more prestige brand names (Smashbox, Vasanti, Gucci, Stila, YSL).. at least one in each box! Then in 2012... mostly brands I've never heard of. Don't get me wrong, I loved a couple of them, but most of the time they have been mediocre compared to before... And the brands I did like are hard to find as they aren't sold in Sephora and not anymore on Glymm's shop! Anyway that is my opinion/theory. I know others enjoyed the niche brands more..
Another reason might be because they were giving out way too much free stuff with their (old) reward system and gift cards. I'm glad everything is cleared up now and everyone can stop anticipating the "newsletter" or their next glymm bag and get their money back and move onto other companies. Topbox seems to be going strong and I hope they stick around for a very long time as I enjoy their boxes. i started my glymm subscription in december 2011 and i loved my first box. i agree that the quality started going downhill and became very hit and miss but i was definitely one of the subscribers who liked the niche brands. in terms of the company's unsound financial management, i think the main issues were the points system and the lack of customer service. they were giving away free products left, right, and centre because the points system was structured so poorly. it's too bad because i thought glymm had the most potential as it was the only company that was set up with an online boutique from the very beginning. it should have been a good business model but instead it totally failed. i too am glad this whole fiasco is coming to a close. we can finally get our refunds and move on! So glad everything is finally said and done! So blown away about all that went on with glymm! Glad it is all sorting itself out finally! for sure! i feel like a weight has lifted now that i don't have to think about this anymore! Have you been dealing with your bank in person or by phone? i called mastercard... the dispute resolution line. i've spoken with them twice and they've been very helpful! please let me know how it goes with your refund... good luck!! Can you remember how much you paid for the year promo? I found the date I purchased it but not the exact amount. They never sent me a invoice or receipt!?! But I'm pretty sure it was taken from my Visa. I'm just wondering the total was it 120$+tax? Did you argue the whole refund or partial? I'm with scotia bank visa. Thanks! yes, i paid $120 plus tax. if you look at your previous credit card statements, you should be able to find the charge. or if you call your credit card company, they will be able to look up the charge if you give them the date of purchase. i filed a dispute with mastercard for 7 months as i had received 5 months of bags. the charge i am disputing is around $79. hope that helps!! It's for this reason than I don't want to pay one year before. But i know we can to save a lot of money with this kind of plan. So! It's a choice and we need to think before. For other beauty box, it's important to keep all subscription and credit paper. I hope than all of you will receive a refund. i too had reservations about paying for the year but i was drawn in by the nail polish promotion! it's definitely important to keep all records especially if you are paying in advance. fortunately, i had everything in my e-mail and was able to send it over to my credit card company immediately. thanks for your comment, marie-eve! I had my first and last box from Glymm in December 2011. I had a bad feeling about them from the very start. I'm glad I never wasted money on this company. I hope you get your refund back! thanks!! i hope i get my money back too. fortunately, my credit card company has been very helpful. i wasn't sure of the process as i've never had to file a dispute before!! i have a yr subscription with them.. so do i get my money bac? yes, you can get a refund for any months you did not receive. i still had 7 months remaining so i filed a dispute for those 7 months. they just take the full subscription price you paid and pro-rate it for the months you did not receive. the last paragraph of my blog post explains a little more but you will have to call your credit card company to explain the situation and file your dispute. good luck!! Every credit card company dispute policy is different it would seem. I have to write a letter detailing everything, the service offering, the lack of service, the prices, invoices etc and provide paperwork to support everything...but at least I can write the letter now as Desjardins wasn't going to let me dispute anything till there was a letter from the company saying they were closing or a bankruptcy notice. Hopefully I'll get the $100 I'm owed for the remaining 9 months in my subscription. So many, including myself, were lured by the free nail polish promo...I think it was just a way for Glymm to drum up short term capital...glad this thing is over now too. Hopefully we'll all get our money back. Wow! I got out just in the nick of time. I unsubscribed in Feb. I had subscribed for about a year. The products were nothing special and after the two price increases, I had enough. I'm so sorry to hear that they didn't inform customers about what they would do for customers who purchased year memberships. That is just wrong! I hope you get your refund in the end, it is not fair to you that you had to do all the work to get your refund. Glymm should've just issued refunds to everyone who had long term subscriptions. yes, you definitely got out at the perfect time!! i have no idea why this company was run that way... it says a lot about the owners / leaders and i would not ever want to do business with them again. Horrible company. The owner needs to be held responsible for this. I can't believe they didn't mention anything at all about refunds. Glad you're working on getting your money back. I hope others can too. yes i agree that the owners need to be held responsible!! i would definitely think twice about pre-paying in the future. it's been such a hassle with glymm! Do any of you know a number ı could call ? I had no idea they were closing and subscribed for 6 months in march. i'd recommend calling your credit card company. glymm has officially closed and no one was answering the phone there for weeks prior to the announcement anyway! Wow. It's such a relief to finally see this even though it didn't affect me. I'm glad the dispute is under way for you! thanks traci!! i'm definitely relieved. now to get my credit... fingers crossed it will come sooner rather than later! Just a heads up that I subscribed to Glymm Man but cancelled last month (luckily). I never received tracking numbers for my first box nor the one I was supposed to receive in March and I asked about this. Fed up with all of this, I cancelled. I still had a stop payment on GLYMM 2 MONT-ROYAL through my TD VISA card company. Glymm is completely sketchy now and they might try to continue charging your credit card. They disputed the two charges that I received for my March box (paid in Dec) and June box (paid in Mar). They said I would have those charges reversed and should appear on my credit card bill in the next couple days. I was surprised how they did this with no questions asked and I didn't have to provide any evidence of Glymm's disappearance. I guess that means more people are calling their credit card companies about this problem. thanks for the heads up!! i will keep an eye on my credit card. i'm glad people are calling to get their refunds... i don't want glymm to get away with a single penny! hi! i am going through the dispute process now as well and you mentioned in your blog post that you had the email invoice showing the charge but I cant seem to find any trace of a email confirmation from glymm in my mailbox... do you mind telling me the title or sender of the email so i can maybe search for it in my email?? thanks soo much in advance! hi there! 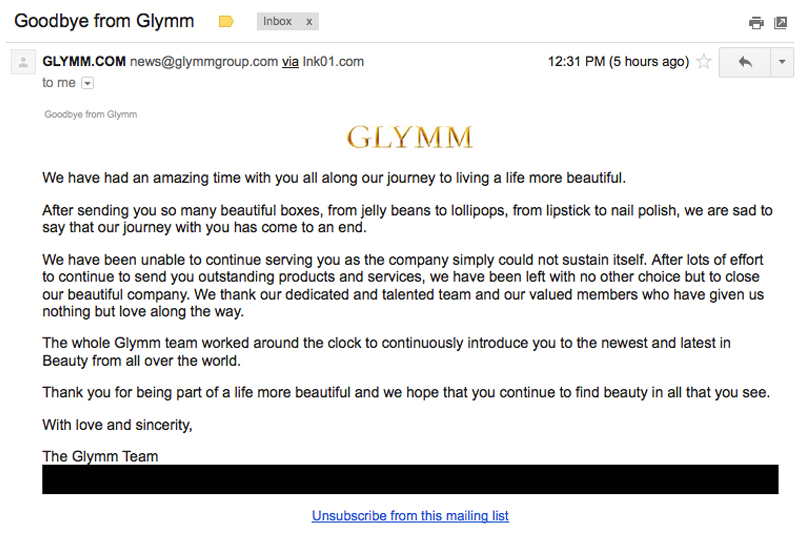 the sender was "Glymm Sales" or sales@glymm.com and the subject line was "You Made Your Life More Beautiful!" hope that helps and good luck! I cancelled my subscription months ago when I noticed all the bad hype. I was charged for one box and still haven't received it. The costumer service person told me that my last box would be the april box. Should I wait until I see that box or should I just call my credit card company now? Opinion? the company has officially closed and no boxes have been shipped out since february... i would suggest calling your credit card company now. good luck! This information has nothing to do with Glymm. It seems that GLOSSYBOX has now closed their doors. However, they are promising refunds to their subscribers. Those who have yearly subscriptions are to receive refunds on pro-rated basis. Who will be next? ?